and I've been working on myself and my structure for a decade. One breakthrough I got from this day is going to be worth $750K in new income over the next 12 months. I don't know of any other ONE thing that can give a person so much focus, clarity and structure to live a perfect life and have a perfect business. Do whatever you have to in order to make it out to Craig's next event!" more wealth, more health, better social and personal relationships – the whole nine yards. As someone who has been practicing and writing about personal productivity for many years I feel I can tell the difference between a strategy that looks good on paper and one that works in the real world of constant demands and time constraints. Craig’s plan is for real. Another thing I like about it is that it is more than just a book that explains a system. It’s a kit, and comes complete with supplemental material, work sheets, and coaching that will help you put it into practice immediately. I have a copy on my desk that I’ve gone through several times. Each time it gets better." “Before getting The Perfect Day Formula I struggled with being available for my husband and children while still accomplishing my most important work responsibilities. I would often end the day in complete frustration and feeling like the day had gotten away from me. The Perfect Day Formula was truly life changing for me. Not only did I get more done, I opened up more time in my schedule for my family. Using this success system made the rest of the day flow much better. I never got to the end of the day feeling like I hadn't accomplished anything. This helped me get more done and make more money. The principles you'll learn in Craig's system are essential for every busy entrepreneur, as well as any busy parent who wants to feel accomplished each day. Craig, I am truly grateful for your work. It has not only changed my life, but the lives of my children as well." “As a busy chef and author, it was hard to make time for my family of 7. I was always meaning to take time off work, but the more I worked, the more I felt I had to work. It was an addiction. When I would take a day off, it didn’t feel right. It felt like I was doing something wrong. It was a destructive cycle for my family. The biggest lesson I learned from Craig was his Perfect Day Paradox of ‘Structure = Freedom.’ If you had told me that before, I would have shrugged my shoulders and stepped away. It's completely counter-intuitive at first, but it works, and now it makes perfect sense! This made a huge difference in my life and in my relationship with my wife. We now have a much better understanding of what’s really important in our lives. In only a few months, we were able to redesign our days to have more time for our children, and for our personal sanity. Life is less crazy now that we have more in control of our lives. If you want more free time in your life, you MUST follow Craig's Perfect Day Formula. I only wish I had this in my early 20s. It would have saved me a lot of trouble. It will change your life!" 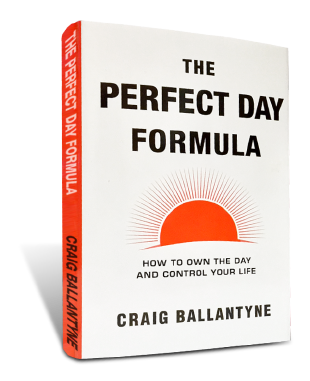 Get Your Free Copy of "The Perfect Day Formula"
Join 25,000 other high-performers who have this book and have changed their lives for the better. Click below to get your copy for FREE!